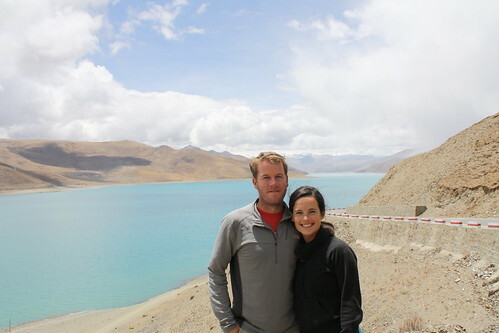 We had a mere seven days in Tibet. It wasn’t enough time to dive deep into the culture or gain any real insights on this dying nation. What it did offer was a glimpse at the natural splendor of the country and a window into the life of the Tibetan people. Here’s a look at how we spent our days. Just across the Tibetan border, we were ushered into a large bus to begin our journey. Here laid before us, amidst the snow-capped peaks of the Himalayas and barren terrain of the Tibetan plateau, was a road stretching into the horizon. It’s known as the Friendship Highway and stretches from the Nepal border to Lhasa, the capital of Tibet. 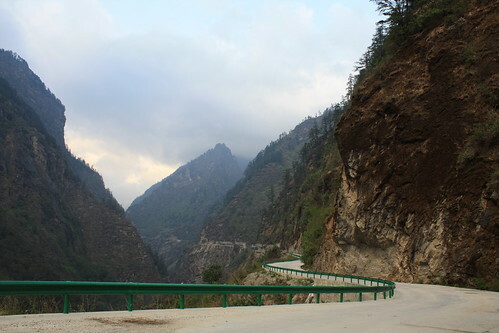 The scenery on the highway features stunning views of the snow-capped Himalayas, vast grasslands and meadows, and other unforgettable sights. Getting across the Himalayas has been very difficult throughout history which has helped preserve the culture of the people living there. Many weeks of mountain walking were once required, but the Chinese have set out to change all this. You can now traverse the country in just a couple of days. We left the small village of Nylam behind and began our journey to Lhotse. We climbed high into the Himalayas with peaks seemingly kissing the sky. By noon time, we were at the Lalunga Pass, reaching over 15,000 feet. Sitting atop the roof of the world, the land was covered in a blanket of snow and the wind blew ferociously. You could hardly see three feet in front of you. 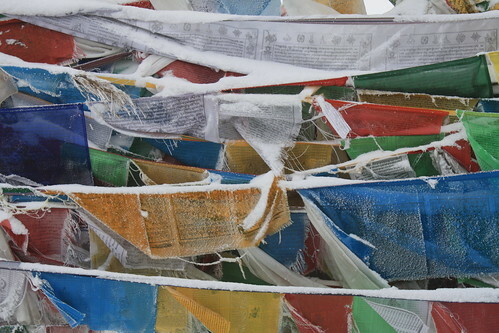 The only view in sight were tangled bunches of colorful Tibetan prayer flags flapping in the wind. As we descended the pass, the sky cleared just enough to see the peak of Mount Everest jetting out over the clouds. We watched the sun rise over the mountains this morning, casting down on a beautiful Tibetan village outside of Lhotse. The Tibetan architecture is very unique. The buildings are all one story and sit very low to the ground. They are made of mud, it looks like, and painted white. All the windows and doors are ornately decorated with colorful awnings and big, brass doorknobs. We paid a visit to a small monastery and came across saffron-clad monks thumbing prayer beads and chanting in unison. 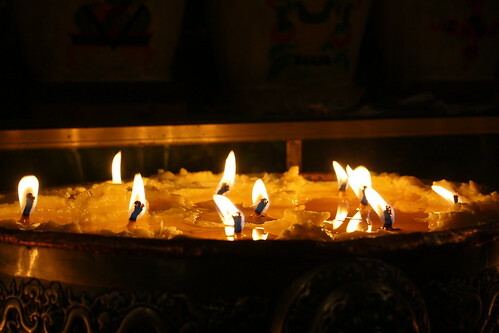 They invited us in to witness the intimate prayer session inside a dimly lit golden temple honoring Buddha. Today is my 28th birthday! It’s not every year you can say you are celebrating in Tibet, right? We made an early morning drive to the town of Gyantse. The most well-preserved of Tibetan villages we’d be staying in, this place was a fairytale. Here a medieval fort sits at the tip-top of a mountain, guarding a snow-colored village. As you can imagine, life is simple here so a birthday splurge was out of the question. Ryan did his best to make it special and made arrangements with our guide for dinner reservations and to have a surprise birthday cake await us. Our guide, in his broken English, only got half the story. He misunderstood Ryan and instead of hearing cake, he heard the word party. He spent the remainder of the day gathering up every Westerner in town for a surprise birthday party for me! When we walked into the restaurant for an anticipated intimate dinner, there were thirty others there to surprise me and a surprise it was for the both of us! 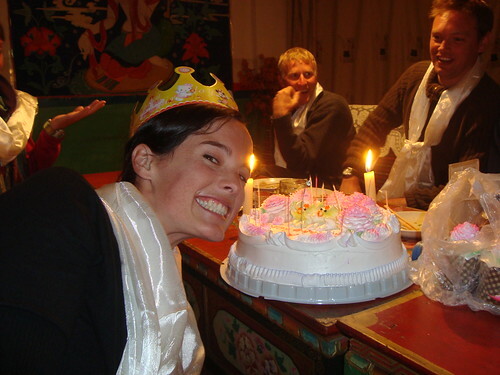 They dressed me in white cloths and a golden crown and brought out a cake big enough to feed all 40 of us. A highlight of the night was when they sang happy birthday. Just as it came time to sing “Happy Birthday dear…” it grew completely silent. No one at my birthday party knew my name! Was certainly a birthday to remember. Today was a full day of driving while we made our way to our final destination of Lhasa. The scenery today rivaled anything we’d seen before. We reached the highest pass on our journey at nearly 16,000 feet. Here we were surrounded by beautiful snow-capped peaks and glaciers sitting in the clouds. Climbing back down, we passed beautiful lakes and fields of yaks and nomadic hill tribes. We spent our day exploring the mystical city of Lhasa. It’s lined with monasteries and temples and smells of incense and yak butter. 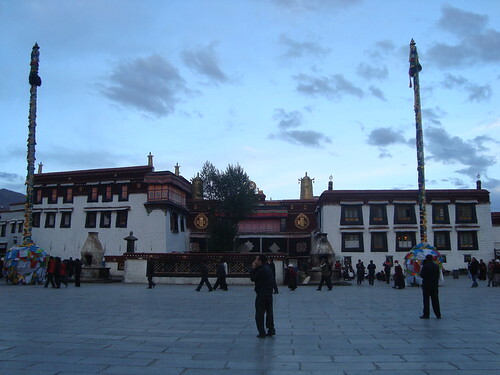 For centuries it has been the center of Tibetan Buddhism and headquarters for the Tibetan government. Today, it’s largely occupied by the Chinese, seemingly closing in on the Tibetans. 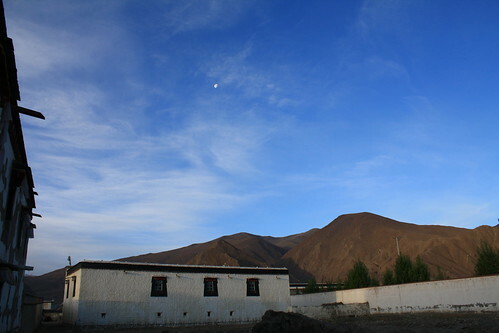 The old city is where the Tibetans live. Although it’s being encroached upon by Chinese modernization with each passing year, it still retains its ethereal charm. Today we paid a visit to the most important monuments in Tibet, the Potala Palace and Jokang Temple. 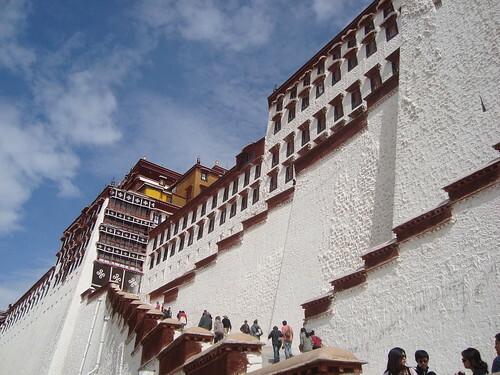 The Potala Palace was founded in the 7th century as the winter home of the Dalai Lama and main government building. 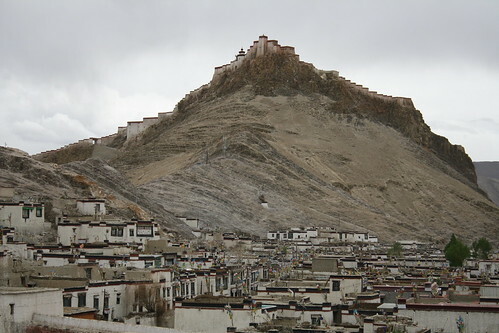 The complex sits thirteen stories high, built on a red mountain in the center of Lhasa Valley, at an altitude of 11,500 ft. The Jokang Temple is the center of Tibetan Buddhism. Thousands of devout Buddhists circumvent the temple daily while clinching their prayer beads or swing brass prayer wheels. Others express reverence by prostrating (laying face down with legs and arms fully extended) in front of the temple for hours at a time. The beauty and originality of the architecture of these monuments can only be rivaled by their rich ornamentation and harmonious integration in the stunning landscape. Beautiful pictures and great writing! Hope you have a fantastic visit to Tibet! Sure hard to break out of the Chinese group tour travel regulations so hope you are able to do so and see a little more of the culture than we were able. Truly a special place.